Get 40% off seafood & lunch Hong Kong Dim sum @ Ah Yat Seafood. 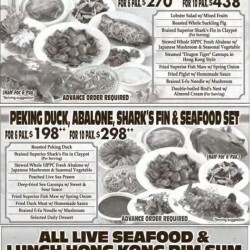 Peking duck, shark's fin & all seafood set. from monday-friday for 6 pax. $126 for 10 pax.$198 . saturday, sunday & public Holidays for 6 pax. $150 for 10 pax. $238 Suckling pig,Abalone,Bird nest for 6pax.$270 for 10pax. $438. 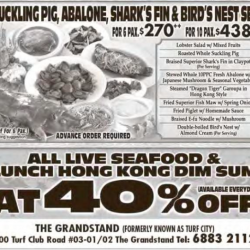 Ah Yat Seafood offers 40% off All Live Seafood and Lunch Hong Kong Dim Sum.